While in town, we stopped by Paint On Pottery in Orange Park, to make Bryan's very special 5 year old handprint plates for his grandparents for Christmas! Diane, the owner, was very patient and kind and helped Bryan paint his hands and carefully stamp the plates! Afterwards, Bryan was happy to paint his own race car all by himself! 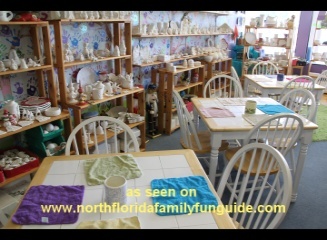 Paint On Pottery is a small, charming, paint your own pottery studio, where you can choose from hundreds of pieces and create your own work of art to keep for always. They offer summer camp programs, and moms night out events too! Birthday parties are very popular here, and everyone who has a birthday party gets to put their handprint on the wall!